In cones, PDE is a homodimer of alpha chains, associated with several smaller subunits. Both rod and cone PDEs catalyze the hydrolysis of cAMP or cGMP to their 5’ monophosphate form. Both enzymes also bind cGMP with high affinity. The cGMP-binding sites are located in the N-terminal half of the protein sequence, while the catalytic core resides in the C-terminal portion. ↑ Arkinstall S, Watson SP (1994). "Opsins". 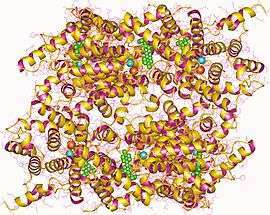 The G-protein linked receptor factsbook. Boston: Academic Press. pp. 214–222. ISBN 0-12-738440-5. 1 2 Deterre P, Bigay J, Forquet F, Robert M, Chabre M (April 1988). "cGMP phosphodiesterase of retinal rods is regulated by two inhibitory subunits". Proc. Natl. Acad. Sci. U.S.A. 85 (8): 2424–8. doi:10.1073/pnas.85.8.2424. PMC 280009 . PMID 2833739. 1 2 Kroll S, Phillips WJ, Cerione RA (March 1989). "The regulation of the cyclic GMP phosphodiesterase by the GDP-bound form of the alpha subunit of transducin". J. Biol. Chem. 264 (8): 4490–7. PMID 2538446. 1 2 Liu Y, Arshavsky VY, Ruoho AE (January 1999). "Interaction sites of the C-terminal region of the cGMP phosphodiesterase inhibitory subunit with the GDP-bound transducin alpha-subunit". Biochem. J. 337 (2): 281–8. doi:10.1042/0264-6021:3370281. PMC 1219963 . PMID 9882626.